Simple and quick, this easy macaroni salad recipe is a breeze to make from scratch. It’s a classic side dish in our family. I love how easy it is to make and how yummy it turns out. This recipe is a go-to dish all year round. 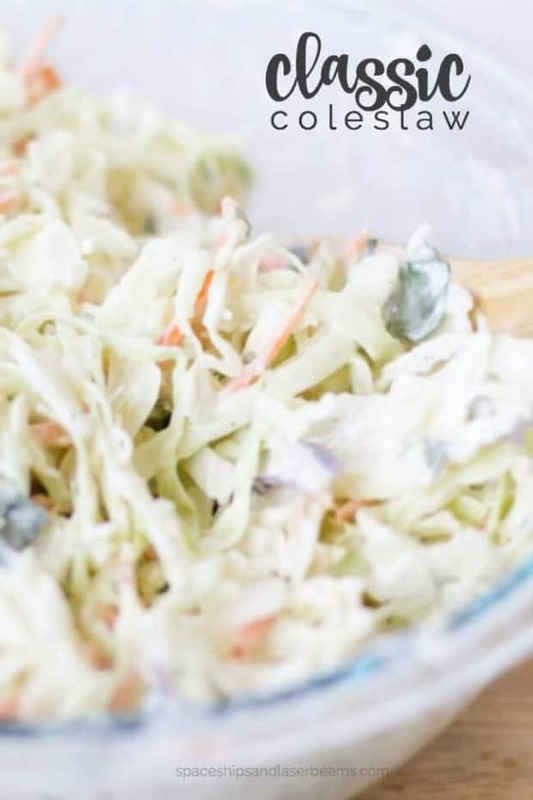 I serve it at potlucks and barbecues as well as large family gatherings and parties — alongside other side dishes such as this classic coleslaw recipe and scalloped potatoes. Do you dare ask for a classic dish like macaroni salad when you’re at a restaurant or are you a purist who says their own pasta salad is the best? The thing about a macaroni salad recipe is it’s quick to make, with very little cooking and one batch makes several servings. If you can boil water, you’re golden. So when something that delicious is so simple to fix, a little experimentation never hurts. What do you put in macaroni salad? 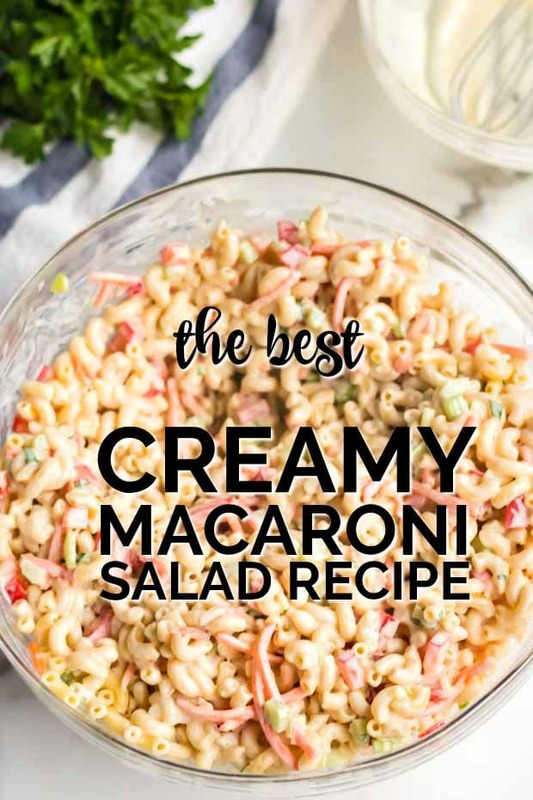 Even though the ingredient list for macaroni salad has room for lots of variation, I think everyone agrees it must have at least some creamy mayonnaise and it must be cold. The best macaroni salad I ever tasted included: red pepper, celery, carrots, green onions, parsley, vinegar, a bit of sugar, sour cream, Dijon mustard, plus salt and pepper (recipe follows). And no matter if you like your salad sweet, spicy, or sweet n’ sour, you can create your preferred version by adjusting add-ins. If you’re feeling adventurous, here are some ingredient possibilities: olives, pickles, pickle relish, cucumbers, radishes, pimentos, green peppers, roasted red peppers, grape tomatoes, kidney beans, boiled eggs, peas, baby corn, cheese cubes, red onions, banana peppers, bacon, ham, hot dogs, chicken, turkey, tuna, and crab. Boil pasta according to the package directions—but slightly undercook so it doesn’t become mushy when you add dressing—and drain well, but don’t rinse. Toss it with a little olive oil so it doesn’t stick together. Avoid using butter because it will clump when it becomes cold and that changes the salad’s taste. Then toss your chosen add-ins with the pasta, gently folding ingredients together with a spatula or large wooden spoon so the macaroni retains its shape. I think there is a better flavor melding if the add-ins are in smaller pieces or chunks. For example, halve cherry tomatoes, dice celery, and cube the ham. If you decide to include bacon, I suggest cutting it in bite-sized pieces before you fry it. That way it’s ready to be tossed into the salad without further messy crumbling. 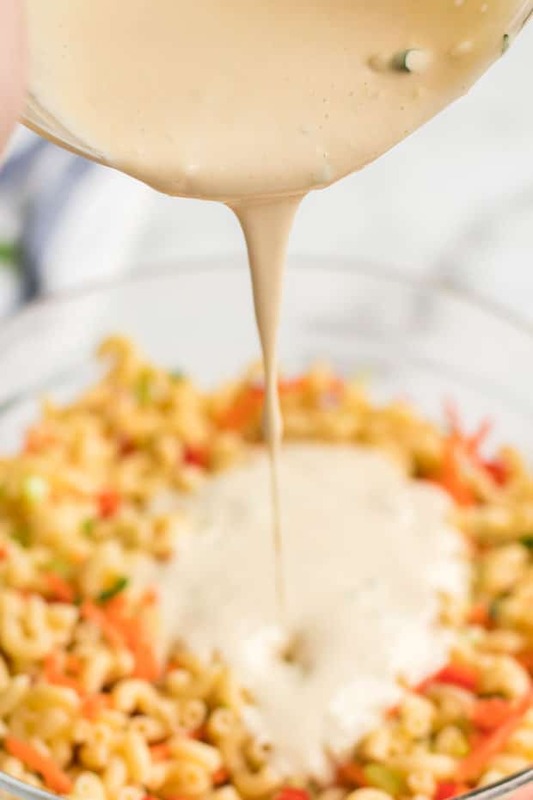 For dressing, whisk mayonnaise, sour cream, sugar, vinegar, mustard, and parsley (or your chosen dressing version) together and pour over the salad. Be generous. I like to chill the entire salad for a minimum of two hours before serving but six hours are even better. Are you getting hungry? Stick with the classics or dare to try something new. Macaroni salad is a crowd pleaser. Time to get that pasta boiling! Don’t miss this delicious brussels sprout and orzo salad. This easy Mexican layered salad is perfect to enjoy any time. 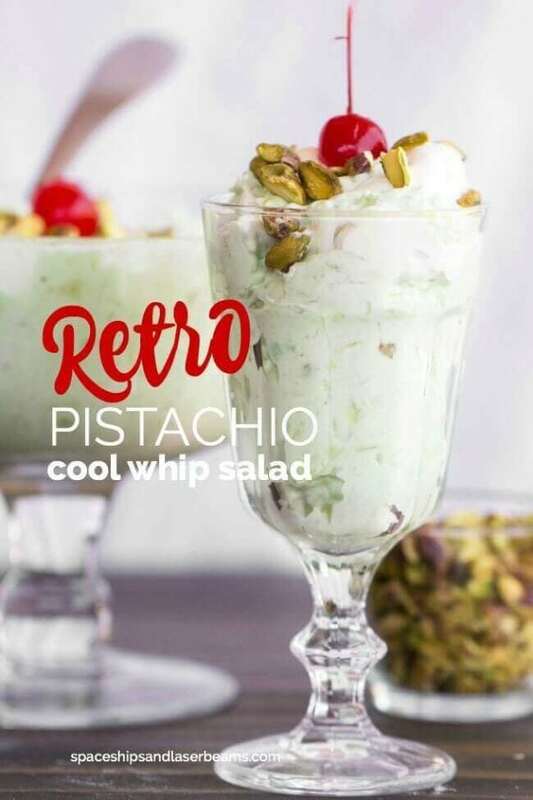 Try this ambrosia salad for your next gathering… delicious! These baked beans are another family favorite. You’ll love this incredible corn on the cob as well. 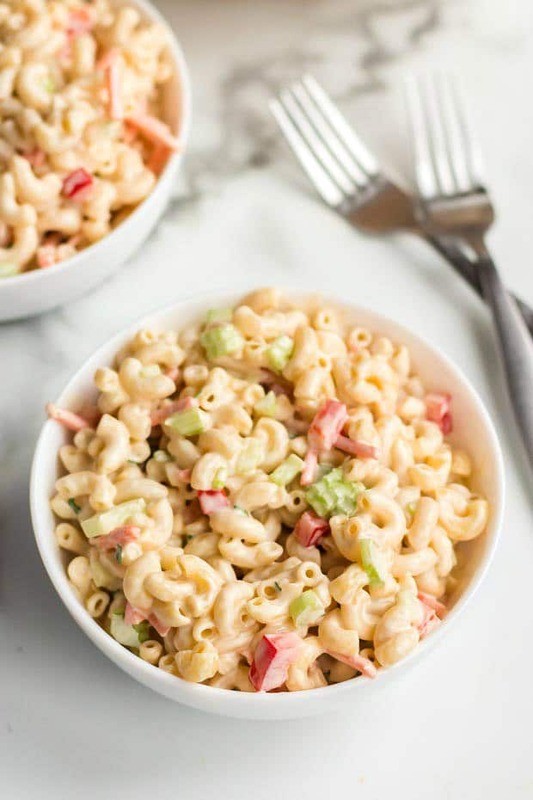 This quick and easy Elbow Macaroni Pasta Salad is the absolute best! In a large bowl, toss cooked macaroni with celery, red pepper and carrots. In a small bowl, whisk together mayo, sour cream, sugar, vinegar, mustard, green onions and parsley. Pour over macaroni and toss to coat. Refrigerate until serving. Can you email me macaroni recipe? how big is the box of macaroni? 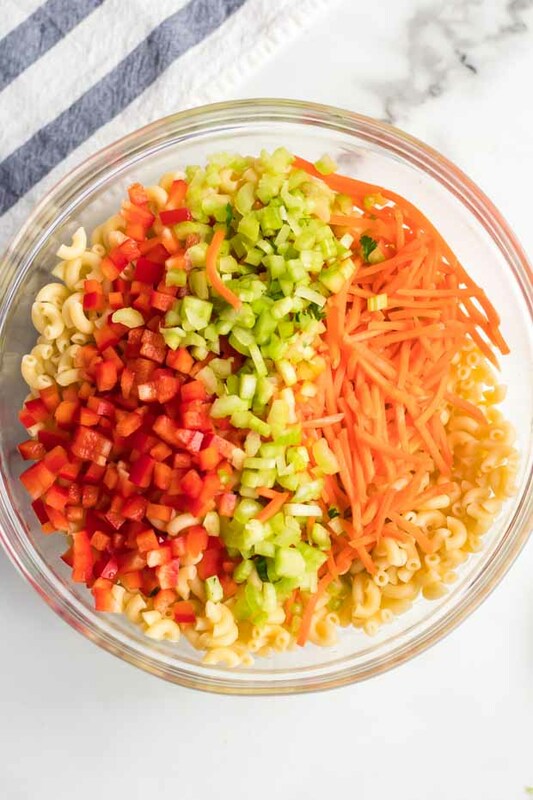 Love the combination of veggies and the dressing recipe you have for this macaroni salad! 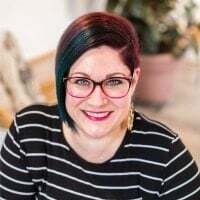 I’m pinning and making! 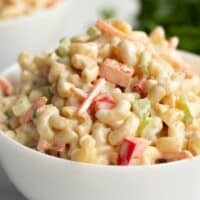 Macaroni salad is one of my favorites and this recipe definitely did not disappoint.